The Encyclopedia of Puget Sound will feature updates to A Marine and Estuarine Habitat Classification System for Washington State. Species and their habitats are a foundation of the ecosystem framework, but there is currently no generally agreed upon habitat classification system for Puget Sound. 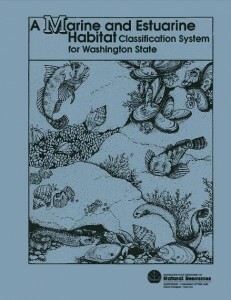 The closest thing for its marine and nearshore environments may be Dr. Megan Dethier’s 1990 resource A Marine and Estuarine Habitat Classification System for Washington State. Much of the work for that document was done in the general vicinity of Puget Sound, and it has been an influential resource for major habitat mapping efforts in the region, such as Shorezone. Last year, PSI’s Encyclopedia of Puget Sound commissioned Dr. Dethier to update some of the diagnostic species and “common associates”—the species you are likely to find in a given habitat—from this resource. Encyclopedia of Puget Sound topic editor Si Simenstad also contributed new information for area fish distributions.